Students & Volunteers for the Environment (SAVE) – Individual Membership | FEED, Inc.
FEED’s environmental volunteering projects exist to give students and other (including corporate) volunteers and members of the public the opportunity to make a real difference to the environment and gain invaluable experience along the way. 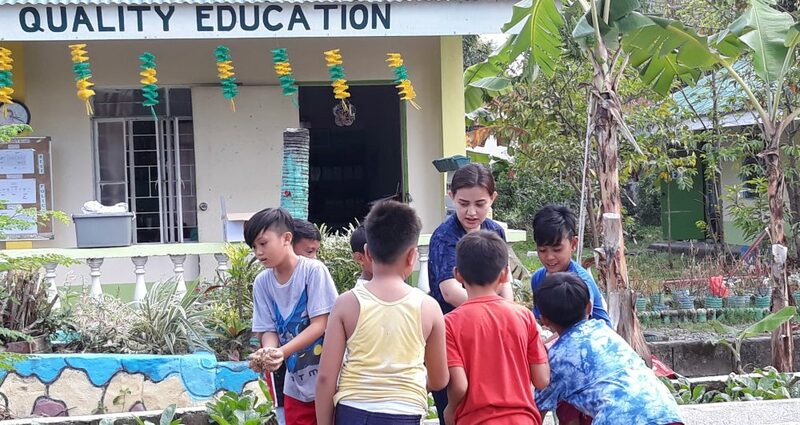 Through our partnerships, you can volunteer with environmental and conservation projects across the Philippines, to develop new skills and turn passion into positive action in the local communities we work with. SAVE programs are also offered through FEED’s Living Legacy Partner iVolunteer Philippines. Visit https://ivolunteer.com.ph (look for FEED in Volunteering Ops). SAVE Members are individuals from around the world, active in various education and/or environmental advocacies,many of whom share a tradition of volunteering their services – typically patrons from the art, culture, education, forestry, fishing, lifestyle, science, sports, water and other sectors to support FEED through awareness-raising efforts, tree-planting, coral restoration and support of other Living Legacy programs. SAVE Members are invaluable resource persons and organizations that directly advance FEED’s Education & Environment vision through the impact of their professions and life callings. They are also often pioneers, prominent and recognized change agents in their respective fields of expertise, who encourage FEED’s mission in education, environment and sustainable development. SAVE Members support the Living Legacy program by giving their time, voices, financing or in-kind donations and efforts to FEED’s causes, receiving in turn either trees and nurseries planted in their name, or on behalf of other friends, family or colleagues. Student / Other Volunteer Membership: PHP550* per year, enables 5 endangered/enedemic Philippine tree species planted in your name during a pre-scheduled Students & Volunteers for the Environment (SAVE) event (includes cost of seedling, tree guards, service and maintenance for at least 3 years to ensure <1% mortality, proper distancing and monitoring by local community and FEED partner forestry experts) + partial contribution to a FEED Scholar’s research + e-Certificate of FEED Membership. Opportunities range from volunteer tree-planting with the University of the Philippines, Los Baños (UPLB), Land Grant Management Office (LGMO), Pampanga State Agricultural University (PSAU), to the Armed Forces of the Philippines (AFP) infantry divisions, including the 2nd ID “Jungle Warriors”, NOLCOM Northern Command (Camp Aquino), and 7ID “Kaugnay” based in Nueva Ecija. FEED also has a number of environmental projects on the ground, where volunteers have the opportunity to plant and grow organic vegetables, plant trees in the orchard, set up nurseries and seedlings banks. Our environmental volunteering is part of LIVING LEGACY: Plant a Tree, FEED Our Future Program – a FEED initiative geared towards reforesting large tracts of denuded indigenous wood forests and farm lands in The Philippines. The SAVE program provides individual and corporate volunteers with opportunities to live green, become more sustainable and make positive environmental choices. ALL SAVE PARTICIPANTS RECEIVE A CERTIFICATE OF APPRECIATION. Adopt a Coral • Sabrina Artadi • Fides Cuyugan-Asensio (Philippines) • Sir Auggie Cordero • Ayala Corporation (Philippines) • Ayala Museum • CMD Flowers & Evergreen Co., Inc. (Philippines) • Mr & Mrs Ben & Cynthia Ching and Family • Kelly Deuster & Aaron Budd & Family • Ernie Estrella (Singapore) • Erik Eggarter (Peru) • Gina Gamboa • Mr. & Mrs. Neil & Lyn Gamboa • the late Gregorio and Lina Gervasio & Family • Martha Horrigan & Family • Joyce B. Hufton (USA) • Dra. Victoria Liban • Maymay & Lior Liechtenstein & Family • Senator Loren Legarda • Lorenzo (Philippines) • Lisa Kircher Lumbao (Philippines) • Dr. Stella Marie P. Mabanag • Robert & Millet Mananquil & Family • Frances Mananquil, Puno Families & Friends (USA) • Marosavel (Philippines) • Manila North Tollways Corporation • Metro Pacific Tollways Corporation • Manoling Morato • Missionaries of the Poor • Munting Nayon • Congressman Victor Ortega & Former Mayor Mary Jane Ortega of La Union Province • Tony Pastor • Philippine Star • Ditta Sandico (Philippines) • Sonya’s Garden (Philippines) • Pampanga State Agricultural University • Former Ambassador Menchu Salas (Czech Republic), Executive Director of the Salas Foundation • SCUBAsurero • Southeastern College • Tollways Management Corporation • Tanlak Beach Resort & Dive Center (Philippines) • ex-Governor Sally Perez • Fe Sarmiento (USA) • Christine, Jovi and Vince Sicangco • Dra. Stella • Siemann Family (Germany) • Donna Africano-Tan (Singapore) • Perlita Tiro (Singapore) • Keith & Rachel Robinson of Zambawood • Lauren Wendell Ng • Mary Ellen Lee • Charlene Remando • Dhenna Emery Uy • Annie Yang • Patricia Denise Babista • Lynford Ma • André Torda • Eunice Mandi • Joanne Catherine Tan • Katrina Llegado • Danielle Matining • Marlo Adriatico • Rhys Bosing • Kitin Lagdameo • Angela de Guzman • Management of Financial Institutions Association. Looking for outdoor fun with a purpose? Join other SAVE volunteers to plant trees in local forests, along national highways, and in mountain provinces of the Philippines. Tree plantings are a great way to get exercise and meet people who share your desire to heal our environment. Every new tree helps beautify The Philippines, protect our water resources and improve our air quality. FEED hosts the tree-planting activities on the last Saturday of each month, with an average capacity of up to 100 SAVE participants. I want to join and become a volunteeer. Hi, I am Laila and I want to be one of your volunteers. I am from CARAGA region. I want to join and be part of this wonderful event for our environment 🙂 But how? Hi!! Please send me details via email. we would like to join. Thank you! Thank you. I would love to be part of tree planting. Send me details please. I, together with some friends, would want to volunteer. Thank you! I want to be a volunteer too so I can help save the environment and make use of my time well. What are the details? Email me at @the.luminary@yahoo.com thanks a lot! Hi im Sam, and i want be part of your volunteers. But how? Hello! I would be very eager to volunteer. How will your volunteer programs work? What is your schedule as of June-August? Hello, we are a small company and we are looking for some CSR initiatives. Do you have any up and coming programs? Hi! This is my calling recently. I want to become a volunteer especialling in tree planting. How to join? Hi how do I volunteer? Please email us at anne@feed.org.ph and we will inform you of registration details, thanks Leslie! Hi JnyRose, Will email you from anne@feed.org.ph and inform you of registration details, thanks and hope to plant with you! I’m interested in joining. but I’m alone, is it okay? I would like to volunteer but Im alone. Is it okay? Do you have schedule this september? I’m very interested to participate in Tree planting activities, i love trees and nature. I also desire to become part of this organization. May you send me the details of the schedule/program of tree planting activities? Thanks a lot! Hope you received our email Jenny and we can plant with you soon! hi, just want to ask if you have upcoming activities this November or onward. I want to join and become a volunteer. hi, i want to join & become a volunteer. if you have any schedules, just let me know. Good day! I would like to ask how can I join as a volunteer. Appreciate if you could send me details. Thank you very much! Hi, good day! We are Engineering Students from UST and I would like to ask how can we participate in your upcoming events? Thank you! Hello 🙂 , Can you tell me more about schedules and how the volunteering works? I’m interested. Hi! I would like to volunteer! How can i join your program? Hi, I would like to ask if there is an upcoming tree-planting activity this coming December-January. Hoping for a response! thanks! Hello! May I ask if you have tree planting activity this November or December 2016? May we please request you to email the details? Hi I’m forestry grad of 2006 however I work now as a call center agent I really want to be part of you team and to update my knowledge coz still hoping to be work related on my course. Would want to know the details how to be part of your activities. I have been a frequent nature traveller together with my travel buddies. We want to be part of nature restoration for the future generation. Hi! My friends and I were wondering if we could participate in your tree-planting activities. Can we be volunteers? I want to be a part of this tree planting. This coming 2017! May I know the details? Thank you and looking forward. Hi I would like to volunteer in your activities. It would really be a great time for me to reach out directly to mother earth. Hi, I want to volunteer. Where can I register? I’m interested. May I ask how to participate? Thanks. Good day! Im a student from Laguna and also a member of PnC Kalikasan. Can I join to your activities? Our company plan to participate to any environmental activities, we would like to ask what will be your requirements or things that we should do in participating to this activities. We prefer to do this in weekday/s. Can you also send us event calendar for this year with the details of location/s. Hi! I would like to ask the details on how to join. Thank you! Dear Micah, Pls let us know if you received our email with more details. Hope to plant with you soon! Hi, I really want to be a part and volunteer, I am just living in Sta. Rosa, Laguna and a Grade 11 student. I hope I can contact you, let us work together and make a change in the world! Thank you very much <3. Dear Luize, We emailed you details, hope you received them on tree planting with us! Hope we can plant with you soon! hi iam jenny. I am interested in volunteering in your org. may i know what to do to be of help? please contact me thru email jennyyuarevalo@gmail.com or text me at 09177701798. Thank you! Dear Jenny, Thanks for reaching out to FEED, we emailed you further details – kindly confirm by email. Hope to plant with you soon! Hello, I would like to volunteer on your activities, please inform/email me on how to join. Thanks! Do you have upcoming tree planting activities in May? I want to volunteer for one day. Thank you. Hi, FEED! Do you have any upcoming tree-planting projects this month of April 22017? Me and 5 of my friends would like to volunteer and document this as part of our project! It’s also to spread awareness and encourage more people to plant trees. Can you email me if you have any activities even if it’s only for a day. Thank you! More Power! Hi! I would like to volunteer for your activities along with my coworkers. please send us details on schedules and how to join. thanks! Hi. We would like to volunteer on your activities. Kindly send ne details on my email. I would love to be a part of your activities. How to be a volunteer? Thanks! Hello I would like to volunteer for our environment. Please send me the details via email. Im available every weekends. Hello! Please count me as a volunteer in this org. pls contact me.thank you. Me and a friend of mine is very much interested in joining your program. How are we going to do so? Please kindly send me an e-mail for further details and instructions. Hope to hear from you soon. Thanks. Hello! I’m very much interested regarding the coral restoration. Can you please send me details regarding this? Hi I would like to volunteer on your tree planting activities, please inform me how to join. Thanks! Hello po. I would like to join about tree planting po. Please inform me how to join po kung pwede pa po? Thank you! Hello. I am planning to join as volunteer for a tree planting activity together with student volunteers. Please send me details on how to become volunteers. And lastly, may I know if you have other seminars related to the environment and if you are willing to hold it in a school? Thanks. Hello! I wish to become a volunteer and help save the environment. I could even bring students from my school. May i know where or when? Thank you! Hi, I’m interested in joining the group and do some volunteering. I’m a University student in baguio city so I don’t know where and how i could join… Can you leave a message for me at this email add? christinenice08@gmail.com… Thank You so much! Hello, we are students from the polytechnic university of the philippines manila and we are currently looking for CSR programs, and we would like to ask if there is an upcoming tree planting program this month of august. I hope you accept me and may I know when is your next tree planting schedule? Good day, I’m Joel and I want to be a volunteer. I would like to share your activities to my students as well, do you have activities within quezon city? Hello there. My friend and I wants to join your tree planting activities. 🙂 Kindly email me at jaypeenyapaul@gmail.com. Hi, I want to become a Volunteer. Thanks.